I don't know about you, but this year has been tough. I have some pretty significant behaviors with very strong personalities in my class. I have found that the more engaged my kids are, the fewer behaviors I see during class. I LOVE Nearpod. I am very blessed that our school is 1:1 with iPads. Nearpod a free app that you can use on a tablet or you can use the website on laptops. I use Nearpod almost everyday in writing. Writing is the most difficult subject for all of my students and it's right before lunch. Tension is high during this time of the day, but Nearpod really helps. Nearpod is extremely easy to use. You can take any of your powerpoint lessons or smaortboard lessons and convert each slide as an image. 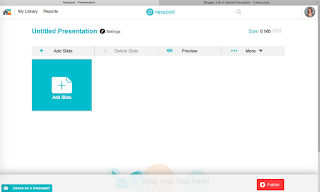 Then you can insert each image into your Nearpod presentation. When I login to Nearpod, this is what I see. To create a new lesson, click on the + icon. This is the next screen. I go ahead and highlight "Untitled Presentation" and rename the lesson. Click on the + to add a new slide. You have 3 choices. Add content allows you to create a slide as you would in any presentation or add a picture (which can also be a slide from a powerpoint or smart board file that you have converted to images.) Add Web Content allows you to add a link to a site for students to explore. Add activity is my favorite and why my kids love Nearpod. Add Activity allows you to add an open ended question, poll, quiz, draw it, fill in the blanks, or memory test. Open ended questions are great for getting the kids interested in the lesson or to assess their learning. The poll allows students to answer an opinion question. The quiz allows you to create a multiple choice quiz for the students to assess learning. Draw it allows you to ask a question that requires students to write/type on the screen. (My kids will work so many more math problems if I do them one at a time as a draw it slide. Fill in the blank is exactly what it sounds like. You type in the text and then select the words from the text you want the students to fill in. They drag the word to the blank. Memory test is a quick game of memory. Students match a set of pictures then they are asked a question. I mix several "content" slides where I teach from and then add in some "draw it" slides to allow students to practice the concept. They will complete 3-4 "worksheets" in a Nearpod presentation without complaint, but will barely put 2 words on paper. Nearpod has greatly increased student participation. 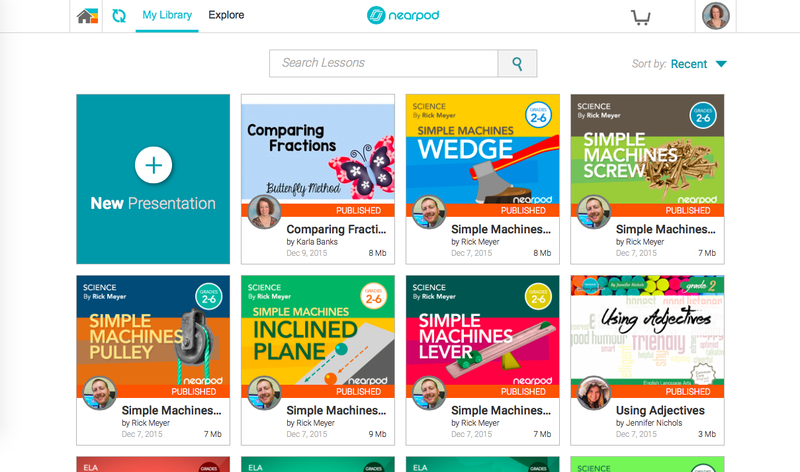 If I don't use Nearpod for a lesson, they will often ask me to make more Nearpod lessons. Here's a lesson that I will use in math next week. You can check it out. Download the free Nearpod app and enter this homework code. This will allow you to proceed through the lesson as a student. You can also download some free lessons from their site to see what it looks like from the teacher's screen. I haven't heard of Nearpod, but it looks like it is worth checking out. Thanks for a new resource.